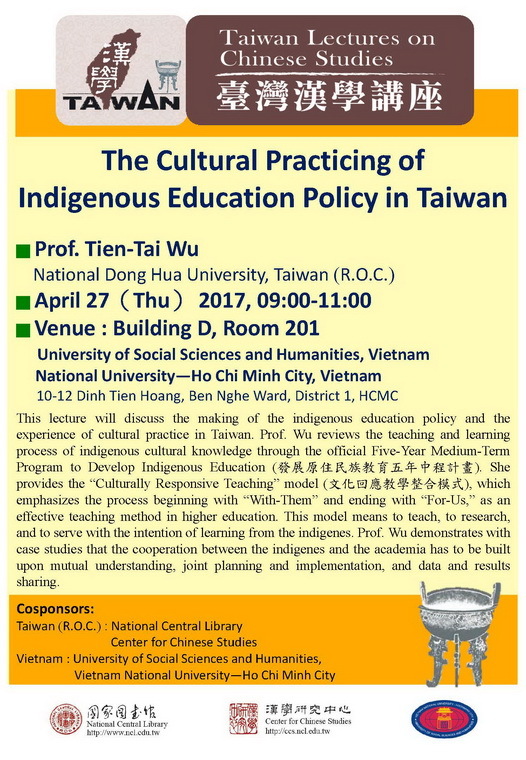 This lecture will discuss the making of the indigenous education policy and the experience of cultural practice in Taiwan. Prof. Wu reviews the teaching and learning process of indigenous cultural knowledge through the official Five-Year Medium-Term Program to Develop Indigenous Education (發展原住民族教育五年中程計畫). She provides the “Culturally Responsive Teaching” model (文化回應教學整合模式), which emphasizes the process beginning with “With-Them” and ending with “For-Us,” as an effective teaching method in higher education. This model means to teach, to research, and to serve with the intention of learning from the indigenes. Prof. Wu demonstrates with case studies that the cooperation between the indigenes and the academia has to be built upon mutual understagnding, joint planning and implementation, and data and results sharing. Prof. Wu obtained her Ph. D. at Ohio State University, USA. 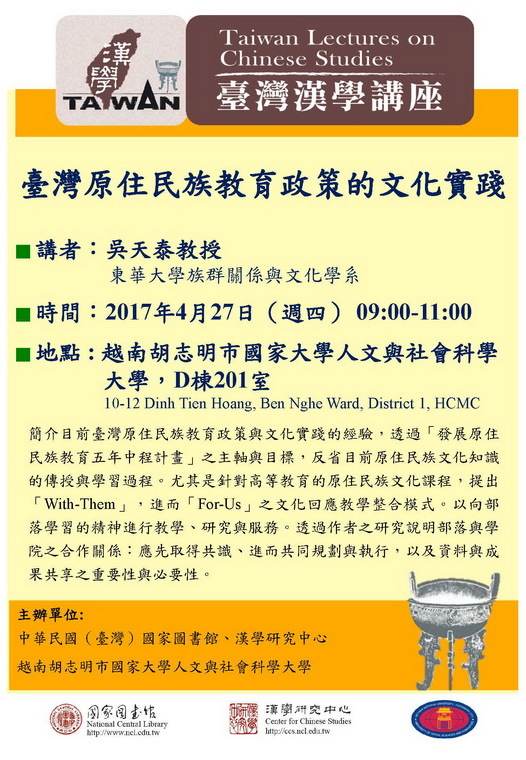 She is a Professor in the Department of Ethnic Relations and Cultures, National Dong Hwa University, Taiwan. Prof. Wu’s major fields are Cultural Anthropology, Educational Anthropology, Indigenous Education, Gender and Culture. She has been consulted by the government on policy issues related to indigenous education and gender equality.